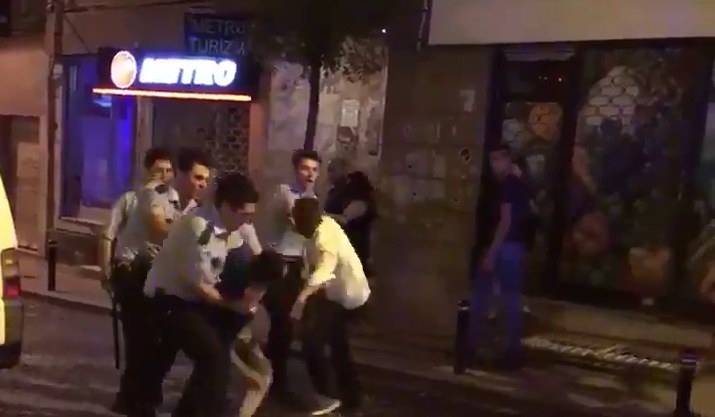 A video that emerged on Tuesday shows the violent altercation between a group of police officers and two men in İstanbul. According to the 45-sec. footage which was recorded by a passersby and released by the iskenceraporu.com news portal, several officers and the two men exchange a series of escalating insults and challenges, and the brawl ends up with officers repeatedly punching the victims dozen times. The events leading up to the incident were not captured by the camera, and therefore it is not possible to hear the conversation between the men and the officers before the incident occurred. The news portal called on witnesses to inform the authorities regarding the incident. The whereabouts of the two men are unknown.